How is video bandwidth use calculated? The total monthly amount of data transmitted each time your video is played is known as your 'bandwidth'. The units we use are GB (Gigabytes). Video bandwidth is calculated by multiplying the number of plays, by the size of the videos. Please note that this is not the original size of the video you upload but the size of the encoded rendition which is played. As an example, if you upload a 10MB file, and after encoding, the video is 5MB, then only 5MB is streamed each time that video is played. If you had 300 plays, then your bandwidth consumption would be approximately 1,500MB or 1.5GB (5MB x 300 plays). Note this is a very rough, ballpark figure. The figure will differ in reality for a few reasons: we have to deliver a player and poster frame for every video; initial propagation of your videos through the CDN that we use to deliver your videos will use some bandwidth; some modern browsers pre-load video data (even though we ask them not to) which can result in some bandwidth use from just loading the player (i.e. an impression). 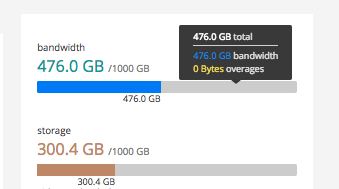 If you're not sure about estimating your monthly bandwidth, we're happy to help. Just drop us a line at support@vzaar.com or grab us on Live Chat - just "Click for Live Help" at vzaar.com.